Glooman can be customized before you download her/him. Prefer a different hair cut? How about a different shirt? Just try on a different one. 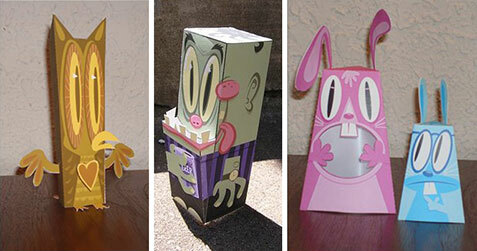 The Nice Bunny Paper Toys. 5 badass (but nice) bunnies by Brian Castleforte. Ghettopaper. 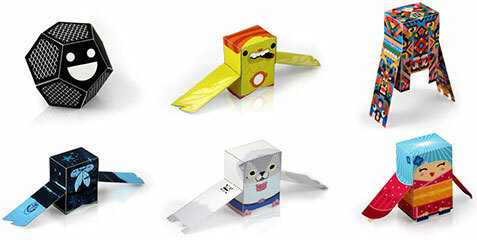 57 little paper ghettoblasters by different designers. LouLou’s Paper Toys. 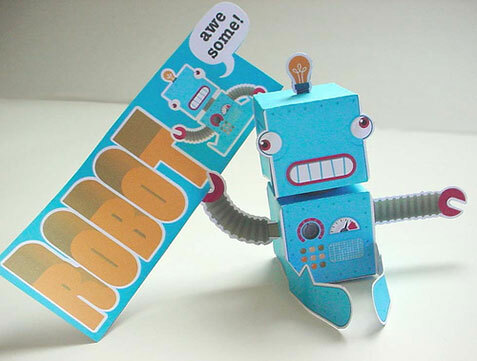 Get this robot and 3 other free wacky paper toys by LouLou. 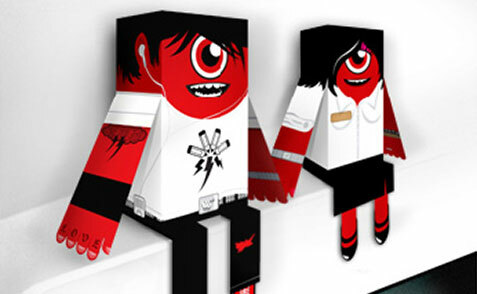 “Paper toys for girls and boys”. Love monsters, sneakers, prototanks, a few free blank templates and even a little DJ set. Lots of great stuff here. Beautiful papertoy by eloole, created for the book sushi 9 by the ADC. The ADC also provides you with a free blank template (PDF). 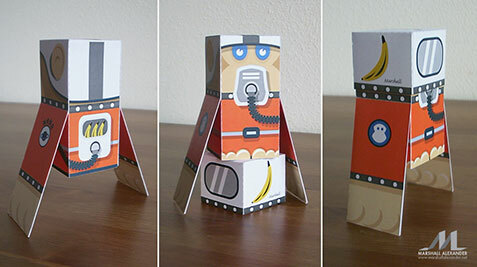 Speakerdog Paper Toys. Lots of cool speakerdogs by lots of designers. Matt Hawkins’ Custom Paper Toys. 6 of them, with a new free paper toy every month. Flickr Monkey’s Paper Toys. These adorable critters are available in different colors. Nana comes with a detachable helmet! What, even more? Alright then, check out these fine paper toy blogs that will keep you updated regularly on the latest and greatest designer paper toys. 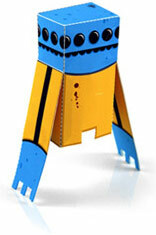 Constantly updated with free paper toys and impressive automata mechanisms (auto… what you say? Looky here). If you have more designer paper toys you’d like to share, please feel free to drop your links in the comments! Also, please consider digging this if you enjoyed it. Thanks! I tried to make my own designs of these once but it just ended up in a lot of shed tears. Great collection of links I’ll have to print them out well not all of them maybe that blue robot. And yeah Joel, they really are damn cool. I’m going to try and invest some time in making my own for download. I hope it is ok that I link to your wonderful page from my blog? Wish there was one that showed you how to invent your own. As much as I love pre-made things its much more fun when it is all you! @devil: I am only linking to the paper toys, not actually hosting them. If you want to place them on your website, you will have to contact the designers and ask for their permission. If you mean you want to reference parts of this article, you are free to do so provided you adhere to the terms of the Creative Commons license on my about page. Its amazing, i have never tried out these, i will be sure to give this a try . Nice post! A nice list, but your are missing some of the greatest paper toy designers. Some great stuff including 8 exclusives for the book! Hey Matthijs, Matt Hawkins is already on the list. :) But thanks for the info on the book. I fixed your link, btw. Bookmarked and shared with friends. I apparently like commenting on this a lot! Que maravilla estos diseños en papel!!!!!!!!!!!!!!! felicitaciones….Lucia. Wow! Those paper toys are really awesome! I want to make one of it because I love doing something that requires attention and patience in finishing it. I think those toys are for display only.